A couple of weeks ago, before the ‘Beast from the East’ arrived, I conducted a guided tour of Goodwood en route to the lambing shed! The cheeky little chap you see here had been born just the night before we arrived. We were a group of about twenty – adults and children and it was clear that the grown-ups were a lot more excited about seeing the new babies than were the children! We oohed and aahed for about an hour and learned lots about all the different breeds that Goodwood rear. Most of the lambs that are sold are cross-breeds, though of course some pure-breeds need to be born each year too. 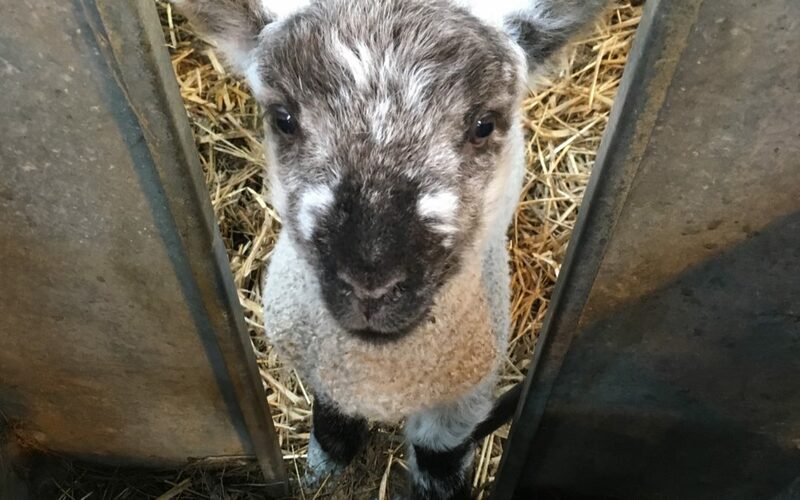 As Goodwood are committed to supplying lamb all year to restaurants and shops, they need to ensure that the lambing season begins as early as possible. So these little ones are being born from the end of January onwards. Because it is so early in the year they are born in a large shed and kept there until they are strong enough to survive outside with their mothers. Then when the weather improves the bulk of the deliveries take place in the fields, with the shepherd making endless rounds of visits to check that the new arrivals are coping well and the mothers are feeding them adequately. When the temperature dropped so low last week I was left hoping that all those expectant mums had been taken into the shed in time. So next time you’re driving near Goodwood, look out for all the little ones gambolling in the fields!